It is when you see an artist use a photograph to create paint a portrait and not any portrait at that, but that of a royal, you begin to see the importance of photography. 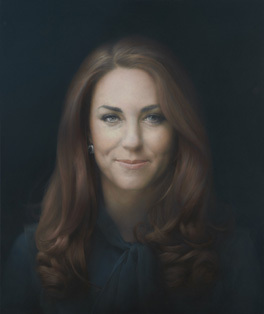 On Friday, 11th January 2013, the National Portrait Gallery unveiled the portrait of Kate Middleton aka HRH The Duchess of Cambridge painted by Paul Emsley. The portrait will be on display at the gallery until 1st September 2013. Catherine Elizabeth Middleton, now Her Royal Highness The Duchess of Cambridge, was born in Berkshire and attended Marlborough College. The Duchess studied at the British Institute in Florence before enrolling at the University of St Andrews in Fife to study History of Art. She married His Royal Highness Prince William at Westminster Abbey on 29 April 2011. In January 2012, St James’s Palace announced The Duchess’s patronage of five charities, one of which is the National Portrait Gallery. Her first solo public engagement was the opening of the Lucian Freud Portraits exhibition and Her Royal Highness has shown a keen interest in portraiture and photography in particular. Glasgow-born Paul Emsley grew up in South Africa and won first prize in the BP Portrait Award (2007). Painting Her Royal Highness at the beginning of her public life, The Duchess was able to give Emsley two sittings, the first at Kensington Palace and the second at the artist’s studio. Emsley’s subjects are frequently located against a dark background and emphasize, ‘the singularity and silence of the form.’ Previous portrait commissions have included the author V.S. Naipaul (2009) for the Gallery’s Collection and Nelson Mandela (2010). Paul Emsley briefly explains how he used photographs to create the portrait of the Duchess.